Take number two, the illness star in the south-west sector, affects mothers, leaders and elderly ladies. They may suddenly fall ill should they interact with this energy source, which will be active in the south-west until 3 February 2014. That said, those who are not mothers, leaders or old—even young women, who are less affected by this energy—should bear in mind that it is always better to be safe than sorry. The I Ching (Book of Changes), one of the oldest Chinese classics, mentions feng shui and includes some of the solid-line and broken-line symbols, all of which have meaning. The symbol on the left comprises three broken lines, representing Mother—solid lines represent yang (male), broken lines yin (female). This symbol is also related to the south-west, while the three broken lines represent the ultimate yin: mother, female leader and old woman. This year, south-west represents the earth according to the feng shui theory of the five elements (wood, fire, earth, metal and water), as does the number two. Because the earth in the chart sits in the square indicating the south-west, the illness star is very strong. Last year, the star was in the north, the direction of water, so it was not as noticeable. You will encounter the same adverse energy from illness star two in the south-west no matter what the building in which you spend a long time. Be it your home or office, the possibility of becoming ill will increase the longer you are there. At home, the rooms in which you spend the most time should be the bedroom and drawing room. At work, if your desk is in the south-west, you will be adversely affected by the illness star. If your bedroom is in the south-west of the building, it would be better to move to another room for the year, since the effects of the number two star can be serious. Should your front door be in the south-west of the building, you would be well advised to be careful, since every time you open and close the door, the illness star will be activated. Although the affliction may be very serious, you shouldn’t worry too much because, after all, you are reading this article before falling ill. While not a health expert, it strikes me that the first thing we might do is to enjoy a healthy lifestyle. Go to sleep early, rise early in the morning, do some exercise and have a healthy diet. Those who do this hardly ever get sick. However, should you feel your health is deteriorating, have a rest or go to a doctor for a check-up. My feng shui guru is a mother and has her own firm. 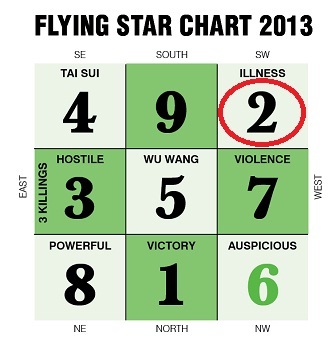 The front door of her home is in the south-west of the building, but she never ignores the number two illness star. Near the main entrance, she keeps a big gold-coloured gourd (hyoutan), which has been recognised as a Taoist symbol for good health and longevity since ancient times. The gold colour overcomes the earth energy of the illness star. Inside the entrance to the home, a large statue of the Medicine Buddha keeps an eye on the energy coming in through the main door. Then, the lights in the south-west of the house are dimmer than they were last year, since light symbolises fire energy, which activates earth energy; to counter the illness star. We can all follow the same practices to overcome the illness star. 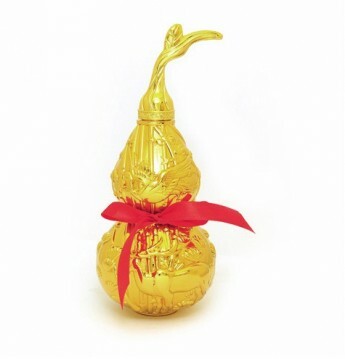 Living in a small Tokyo flat, I need only, for example, a small golden gourd and a painting of the Medicine Buddha. But, should you feel that to be excessively religious, to prevent sickness you could use a symbol of good health from another tradition. We all know that health is the most important element in our lives, and that without it, we cannot enjoy wealth. This year, it is the year of the snake—so misfortunes will approaching without warning. Ladies, please take good care of your health!